I really enjoy making a nice Sunday dinner for my family. Last night's Sunday dinner turned out to be an exquisite one. Everything from start to finish was spectacular. For starting out I actually made a bowl of paleo butternut squash soup to go with our meal. I never make a soup to go with dinner. I just always make soups that you eat as an entire meal. For the main course, I had some grass-fed beef strip steaks marinated in Primal Kitchen Greek Vinaigrette and Marinade. For a side dish, I wrapped Applegate Sunday Bacon around some rainbow carrots (purple, orange, and white) that I picked up during our visit to Eastern Market. This was our first time trying out bacon-wrapped carrots and it certainly will not be the last. Lately, I just want to wrap everything up in bacon! Next up for me will be bacon-wrapped brussels sprouts. See that? Looks mighty fine, doesn't it? That is what you get when you make a dinner date with two brands that I love: Primal Kitchen and Applegate. This is not the first time using Primal Kitchen's Balsamic Dressing/Marinade and it will not be the last. Primal Kitchen consistently comes through and shines with their incredible line of tasty and nutritious products. I made sure my pantry is always stocked with their items. 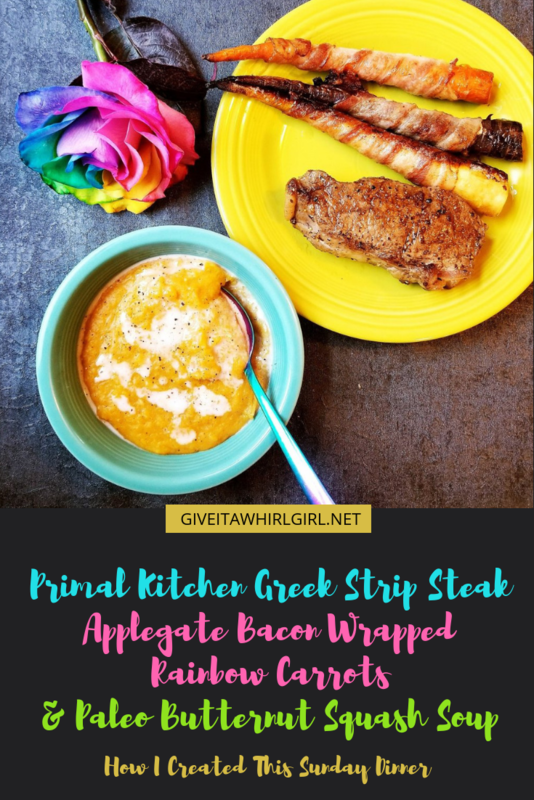 This right here is going to be one of those dinners that is on repeat and in regular rotation here at the Give It A Whirl Girl kitchen. My family of 3 ooh's and ahh's the entire time eating this gluten-free, low-carb, primal meal. 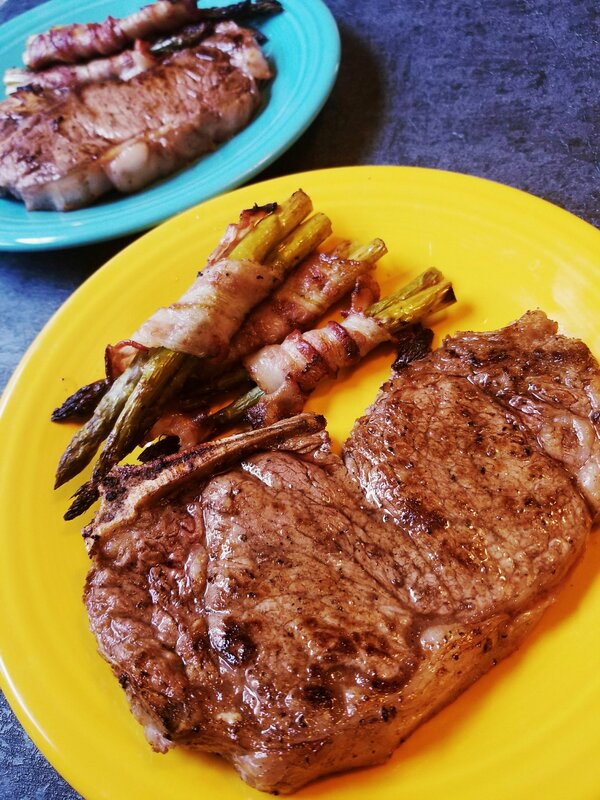 Primal, paleo meal If you are looking for a simple, flavorful steak dinner then I will hook you up with this amazing recipe that anyone could do. You will be eating like a primal caveman in no time with this paleo meal. This particular marinade is created with a blend of balsamic vinegar, avocado oil, and organic herbs and spices. You will not find any refined sugars in their line of products... none! Two tablespoons of this dressing are 100 calories, 1 gram of sugar, and 3 carbs.